Pope Francis is often described as "cool" and “down-to-earth,” but it seems his popularity isn't enough to fix the Catholic Church's dwindling number of priests. A new study says that Europe and the US are importing clergy from Asia and Africa. Thereport, 'Global Catholicism: Trends & Forecasts,' was published by the Georgetown University-based Center for Applied Research in the Apostolate (CARA) on Monday. The research examined “the three most important indicators of 'vitality' for the Catholic Church...the number of Catholics, the number of parishes, and the number of priests.” It analyzed the situation in seven regions around the world. It found that the number of priests worldwide dropped by 17 percent between 1980 and 2012. The largest decline was in Europe, which experienced a 32 percent drop – from 243,319 to 165,229 – in that time period. But as numbers continue to dwindle in Western countries, Africa and Asia are seeing a surge in those entering the priesthood. Africa saw a 131 percent increase (from 17,346 to 40,133) in the same time period, while Asia saw a 121 percent increase (from 27,136 to 60,042). Those numbers are convenient for the US and Europe, which are importing priests from those regions. “A growing phenomenon within the Church is the use of African and Asian priests in the United States, Europe, and elsewhere where there are too few native priests to staff parishes,” the survey says. The survey groups the United States in a category titled 'Americas.' That grouping, which also includes Mexico, Canada, South America, and Central America, showed a small increase in the number of priests (from 120,132 to 122,924). However, a separate set of CARA data tracking the US church found a 35 percent drop in priests between 1980 and 2014. The number of parishes, or churches, has grown by just seven percent worldwide between 1980 and 2012. Additionally, the rate per 1,000 Catholics receiving the sacraments offered by parishes “is in uninterrupted decline worldwide. It’s not keeping up with population growth,” said Mark Gray, senior research associate for CARA and a co-author of the report. That problem is twofold – while those in the West have easy access to parishes, interest is lessening. Meanwhile, those in developing countries often lack access to parishes and priests. Predictably, the regions with the fastest growing priest population have also experienced a surge in parishes. The number of churches has doubled in both Asia and Africa. The Americas saw a 25 percent increase in parishes, while Europe saw a 12 percent drop – totaling a net loss of 16,669 parishes since 1980. “The parishes that served the Church for hundreds and hundreds of years are no longer closely aligned with the world’s Catholic population and certainly not its most frequently Mass attending populations. However, there is no giant crane that can pick up a parish from Europe and relocate it to Africa,” the report says. 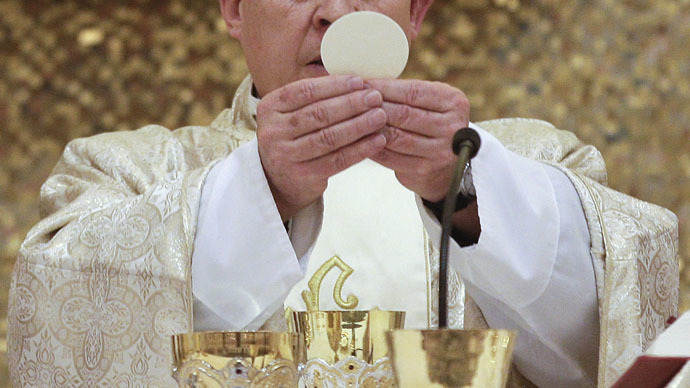 But it's not all bad news for Catholics – their overall number has actually grown by 57 percent (from 783 million to 1.2 billion) globally, despite the shortage of priests. That growth is once again due to Africa and Asia, which experienced a 238 percent and 115 percent jump between 1980 and 2012, respectively. The Americas experienced a 56 percent increase, while Europe trailed behind with a mere 6 percent rise. If current trends continue, the global Catholic population is expected to increase by about 372 million from 2015 to 2050. This would represent a 29 percent growth for the religion, bringing the number of Catholics to 1.64 billion.